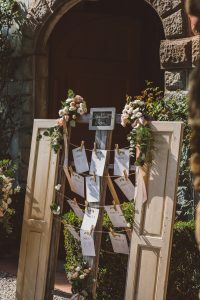 Where did you get married and how did you pick the venue? We have big families and a wide group of friends so we wanted to make sure it was accessible for people, so we chose Europe. 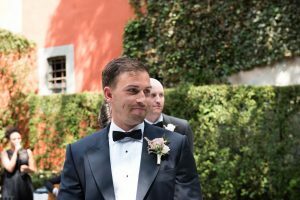 One of our main criteria was that we wanted our wedding to be legally binding, which cancelled out quite a few countries because we are not Catholic, applicable to Spain and all the Spanish Islands, and France it was not possible as you have to be a resident to have a legally binding wedding there. But, to our surprise, we could have either a civil or protestant ceremony in Italy and it be legally binding. 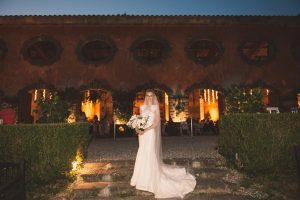 We then started looking at regions in Italy to get married in, we just fell in love with some of the venues we had seen (via the internet) in Tuscany. 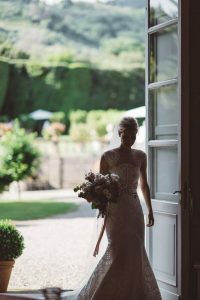 Phil, through his business, knew a wedding planner in Tuscany, so we started speaking to her and then booked a trip out to visit some venues with her. We spent 3 days visiting about 10 different venues, of which we had selected from about 30 we had been sent by our wedding planner. I had fallen in love with Villa Grabau before we had even touched down in Italy, the pictures of it were just magical to me. But Phil, my now husband didn’t want me to have my heart set on a venue before we had seen any of the others, he wanted to go to each one with an open mind. But when we visited Villa Grabau, we both fell in love with it. It had three distinct areas for the ceremony, Aperitif’s and the meal/disco, which was what we loved. It has beautiful gardens and walking from the Aperitif area through to the Limonia, which is a working Limonia, was like being in the film ‘A Secret Garden’, you literally walk through a concealed door in a hedge. The venue was just perfect for what we wanted location wise as well. It is only 10 minutes from Lucca, which meant out guests had a great city to base themselves from. 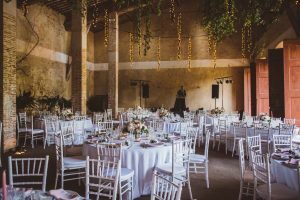 Many of the wedding venues in Tuscany are hours’ drive from any big towns/cities. I’m smiling to myself just thinking about it. How did you hear about our Boutique? Prior to our engagement and after it, I hadn’t done any research into dresses. The thought of it slightly overwhelmed me, if I’m honest. I work local to Henley-in-Arden and my colleagues wife actually got her dress from the shop about 15 years ago. 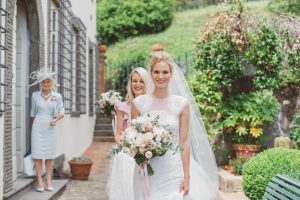 I was aware that wedding dresses have to be ordered quite far in advance, and it got to about 1 year before our wedding, and because I like to know all my choices, I am not an impulsive person, I thought I best start looking as I didn’t want to be rushed, which good job I did, as I am glad I had time to consider my choices. Because I had walked past the bridal shop plenty of times before I was engaged and I always thought it looked really cute, I thought what better shop to start in than a local one. And that was one of the best decisions I made in the wedding planning process . 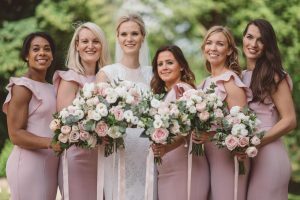 It wasn’t until after I had first visited the shop and was doing some research into other shops in the Birmingham/Warwickshire area, that I had realised how we regarded the Bridal Boutique is and the quality of designers that it stocks. From the 7 shops I visited in the area, it really is the best and my favourite. Madi makes you feel so at ease and welcome and I really loved the feel of the shop. What made you decide your dress was the one & what did you love most about it? The reaction of my Mum, bridesmaid and Madi for one. The dress I chose in the end was actually the second one I tried on, so technically I could have saved a lot of trudging around bridal shops. But, because wedding dresses aren’t something you try on every day, I wanted to try on different style dresses and also try different designers, but by doing so, it helped me decide on the style of dress that suited me and that I also felt comfortable in. I think it also helped that the dress Madi had in stock was my size, so I could really see what it looked like on. Whereas with other dresses, when they have to be pinned, it is sometimes hard to tell what they will really look like. I don’t think I can decide on one thing I love most about my dress. I love the lace, It is so soft and an unusual pattern. But then I also love the shape of it and the train, I had extra added to the train, at the request of my Mum . I also love the high neck and the back of it. It is just so hard to pick one thing. How did you accessorise, ie, which shoes did you pick? 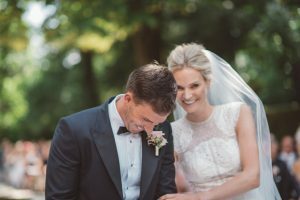 Did you choose a Headpiece or a Veil, or both? I had a pair of blush pink Valentino heels. My Husband isn’t much taller than me and the venue had a fair bit of grass and gravel, so I chose a thick heel which wasn’t too high. I also had a veil, which I loved, it didn’t have any lace but was really quite long and it just felt amazing to wear. Did you have Bridesmaids? If so, what did they wear, how did you pick? Yes, I had 5 bridesmaids. They wore blush pink dresses from a company called TH & TH. I was quite jealous of their dresses, as I loved them and would have quite liked to have worn them myself. They were fitted and had a small train. 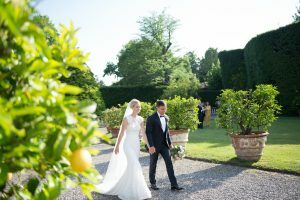 Finally, tell us about your big day ..
Our wedding venue is 10 minute drive from the beautiful city of Lucca and is at the base of the Pizzorne Mountains. It still has the original Renaissance look and has fabulous gardens but then also is a Lemon farm and has a working Limonia where they store the Lemons in the winter. The ceremony area is a walled garden which has several big tress in it, so at 3pm, the time of our ceremony, it has beams of light filtering through the leaves and branches, which is just really enchanting. I walked down the aisle to ‘ A million years’ sung by a fabulous Jazz singer in the band ‘ Jazz it up’. 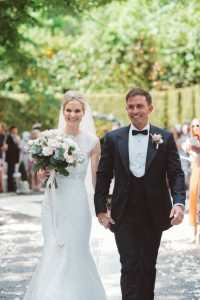 Entering the walled garden, seeing the beautiful flowers we had deliberated over for such a long time, walking with my Dad, seeing all of our guests and then spotting Phil looking back up the aisle to me with the most beautiful song I’ve ever heard is a moment I will never forget. After the ceremony, we had the Aperitif’s in a different part of the venue. It was behind the main villa, and is an area with a gravel path bordering two large lawns which is all enclosed by huge, manicured hedges. We had a lot of food here, with tables full of cured meats, Italian cheeses as well a table full of seafood and, of course, a well-stocked bar. The first glass of champagne I had with my husband was a refreshing moment. For the first 10 minutes of the Aperitif’s, my nephew who was our page boy, thought it was his duty to follow me around carrying the train of my dress. It soon became too heavy for him and he got bored. Phil and I are really into our food and going out to nice restaurants, so the food and drink aspect of our wedding was really important to us. We found a fabulous caterer, Paolo Gozzini of Excibus catering, and he was so accommodating and made the whole process so easy for us. 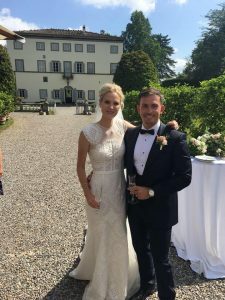 The Italians love their food and we really embraced their wedding traditions. If you have never been to an Italian wedding, the Aperitif’s are as good and plentiful as the main meal. Phil and I wanted to enjoy the Aperitif’s as much as possible, so made sure we didn’t spend too long having photos taken. Our photographers, Lovefolio, were really good and understood we didn’t want to be away from our guests having photos all afternoon, they didn’t keep us longer than necessary. Walking from the Aperitif garden area through the ‘secret garden door’ to the Limonia where the evening meal was to be served was a lovely moment. Seeing our guests see the Limonia for the first time was really nice, as it is such a fabulous, unusual building. It is terracotta colour with several big arch doors which allows the afternoon light to filer thorugh. Inside, it has exposed walls with vines growing up them and from the ceiling, there is ‘Fiscus Pumila’ falling from the ceiling beams, which we had fairly lights attached to. It was magical. This was where we had our meal and disco. For our first course, our caterer did our favourite dish from our favourite restaurant, Fumo. The truffle and Pecorino ravioli was just fabulous and followed by one of the best steaks I’ve ever had. After the dinner, we kept with the Italian tradition and had the chef’s make our wedding cake, Millefoglie, in front of our guests. This was decorated with flower petals and tea lights. Phil and I cut this with the Limonia in the background, it looks great on the photos. After cutting the cake, Phil opened a bottle of champagne with a sabre. Considering he hadn’t practised this, he did a really good job and cut the cork off clean. We were also very lucky, the cork landed on our wedding planners foot, so we got to keep it and it’s now in our wedding memories box. Our first dance was to ‘XO’ by ‘ John Mayor’. 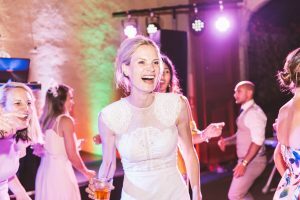 It’s such a lovely song, although it doesn’t really have a key change moment to encourage guests onto the dancefloor, but after a bit of encouragement we were joined on the dancefloor, so it doesn’t really matter. I had put together an example playlist of songs for our DJ to play, and he ended up playing the playlist. He did really well with the order of the songs and gauging when to change the genre or decade, and our dancefloor was just so much fun to be on, particularly when Spice Girls dropped. So in short, I don’t think I can pick a favourite moment, but from the moment I started walking down the aisle, I had the best time ever. Hairdresser: Ben Matthews from Benjamin Ryan @benjmainryanhair. Ben flew out from Birmingham and did 8 people’s hair. He was fantastic and did my hair exactly how I imagined it. He is also a really nice guy and easy to chat to. Make-up- Victoria Shimwell @makeupbyvictorialondon. Victoria is my cousin, but she is also an amazing make-up artist. I don’t usually wear a lot of make-up, so I was cognisant that I didn’t want to look like I had been playing in Mummy’s make-up box. She did my make-up amazingly, and I felt so comfortable. She is also the funniest person I know, which put me at ease in the morning before the wedding. Band: Ilaria Giannecchini from Jazz it up. She can be found on facebook. Thank you to Sophie and Phil for letting us share a little bit of their magical day.